John Gavin Malkovich (born December 9, 1953) is an American actor, producer, and fashion designer. He has appeared in more than 70 films. For his roles in Places in the Heart and In the Line of Fire, he received Academy Award nominations. He has appeared in films including Empire of the Sun, The Killing Fields, Johnny English, Con Air, Of Mice and Men, Rounders, Ripley's Game, Being John Malkovich, Shadow of the Vampire, Burn After Reading, Red, Mulholland Falls, Dangerous Liaisons, Warm Bodies, and Bird Box, as well as producing films such as Ghost World, Juno, and The Perks of Being a Wallflower. John Gavin Malkovich (born December 9, 1953) is an American actor, producer, and fashion designer. He has appeared in more than 70 films. For his roles in Places in the Heart and In the Line of Fire, he received Academy Award nominations. He has appeared in films including Empire of the Sun, The Killing Fields, Johnny English, Con Air, Of Mice and Men, Rounders, Ripley's Game, Being John Malkovich, Shadow of the Vampire, Burn After Reading, Red, Mulholland Falls, Dangerous Liaisons, Warm Bodies, and Bird Box, as well as producing films such as Ghost World, Juno, and The Perks of Being a Wallflower. Malkovich was born in Christopher, Illinois. His mother was of French, German, Scottish and English ancestry. He grew up in Benton, Illinois. His father, Daniel Leon Malkovich (1926–1980), was a state conservation director and publisher of Outdoor Illinois, a conservation magazine. His mother, Joe Anne (née Choisser; 1928–2009), owned the Benton Evening News, as well as Outdoor Illinois. Malkovich has three younger sisters and an older brother. His paternal grandparents were from Ozalj in Yugoslavia (today's Croatia), . Malkovich attended Logan Grade School, Webster Junior High School, and Benton Consolidated High School. During his high school years, he appeared in various plays and the musical Carousel. He was active in a folk gospel group, singing in area churches and community events. As a member of a local summer theater/comedy project, he co-starred in Jean-Claude van Itallie's America Hurrah in 1972. Upon graduating from high school, he entered Eastern Illinois University, and then transferred to Illinois State University, where he majored in theater. In 1976, Malkovich, along with Joan Allen, Gary Sinise, and Glenne Headly, became a charter member of the Steppenwolf Theatre Company in Chicago. He moved to New York City in 1980 to appear in a Steppenwolf production of the Sam Shepard play True West for which he won an Obie Award. In early 1982, he appeared in A Streetcar Named Desire with Chicago's Wisdom Bridge Theatre. Malkovich then directed a Steppenwolf co-production, the 1984 revival of Lanford Wilson's Balm in Gilead, for which he received a second Obie Award and a Drama Desk Award. His Broadway debut that year was as Biff in Death of a Salesman alongside Dustin Hoffman as Willy. Malkovich won an Emmy Award for this role when the play was adapted for television by CBS in 1985. One of his first film roles was as an extra alongside Allen, Terry Kinney, George Wendt and Laurie Metcalf in Robert Altman's 1978 film A Wedding. He made his feature film debut in 1984 as Sally Field's blind boarder Mr. Will in Places in the Heart. For his portrayal of Mr. Will, Malkovich received his first Academy Award nomination for Best Supporting Actor. He also portrayed Al Rockoff in The Killing Fields. He continued to have steady work in films such as Empire of the Sun, directed by Steven Spielberg, and the 1987 film adaptation of Tennessee Williams's The Glass Menagerie with Paul Newman and Joanne Woodward. He then starred in Making Mr. Right. In 1990, he played Port Moresby in The Sheltering Sky, directed by Bernardo Bertolucci. In 1991, he was directed by Woody Allen in Shadows and Fog. He garnered significant critical and popular acclaim when he portrayed the sinister and sensual Valmont in the 1988 film Dangerous Liaisons, a film adaptation of the stage play Les Liaisons Dangereuses by Christopher Hampton, who had adapted it from the 1782 novel of the same title by Pierre Choderlos de Laclos. He later reprised this role for the music video of "Walking on Broken Glass" by Annie Lennox. In 1990, he recited, in Croatian, verses of the Croatian national anthem Lijepa naša domovino (Our Beautiful Homeland) in Nenad Bach's song "Can We Go Higher?" 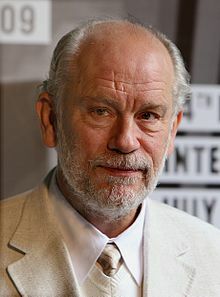 Malkovich starred in the 1992 film adaptation of John Steinbeck's award-winning novella Of Mice and Men as Lennie alongside Gary Sinise as George. In 1994, he was nominated for another Oscar, in the same category, for In the Line of Fire. Though he played the title role in the Charlie Kaufman-penned Being John Malkovich, he played a slight variation of himself, as indicated by the character's middle name of "Horatio". In 1996, Malkovich was directed for the second time (after Les liaisons Dangereuses) by Stephen Frears in Mary Reilly, a new adaptation of the Dr. Jekyll and Mr. Hyde tale, co-starring Julia Roberts He made a cameo appearance in Adaptation. — also written by Kaufman — appearing as himself during the filming of Being John Malkovich. The Dancer Upstairs, Malkovich's directorial film debut, was released in 2002. In the same year he took the title role in Ripley's Game.. He also appeared in Joan of Arc, directed by Luc Besson in 1999, playing the French king-to-be Charles VII. Other film roles include The Hitchhiker's Guide to the Galaxy, Beowulf, Eragon, The Man in the Iron Mask, Transformers: Dark of the Moon, Changeling, Secretariat, RED and RED 2. In 2007, he played Alan Conway in Colour me Kubrik: a True...ish story , directed by Brian Cook. Malkovich has hosted three episodes of the NBC sketch show Saturday Night Live. The first occasion was in January 1989 with musical guest Anita Baker; the second in October 1993 with musical guest Billy Joel (and special appearance by former cast member Jan Hooks); and the third was in December 2008 with musical guest T.I. with Swizz Beatz (and special appearances by Justin Timberlake, Molly Sims and Jamie-Lynn Sigler). In 1993 he was also the narrator for the film Alive. In June 2018, Malkovich began filming a three-part adaptation of Agatha Christie's The A.B.C. Murders co-starring Rupert Grint for BBC television, playing the role of fictional Belgian detective Hercule Poirot. Malkovich was directed many times by the Chilean director Raoul Ruiz — Le Temps retrouvé (Time Regained) in 1999, Les Ames Fortes (Savage Souls) in 2001, Klimt in 2006 and Lines of Wellington in 2012. In 2008, directed by Michael Stürminger, he portrayed the story of Jack Unterweger in a performance for one actor, two sopranos, and period orchestra entitled Seduction and Despair, which premiered at Barnum Hall in Santa Monica, California. A fully staged version of the production, entitled The Infernal Comedy premiered in Vienna in July 2009. The show has since been performed in 2009, 2010, 2011 and 2012 throughout Europe, North America and South America. Malkovich was also directed by the Austrian director Michael Stürminger in Casanova's Variations and its movie adaptation in 2014 (co-starring Fanny Ardant). For their third collaboration, in 2017, Michael Stürminger directed Malkovich in Just Call me God - the final speech. John played a Third World dictator called Satur Dinam Cha who is about to be overthrown. Also in 2008, Malkovich played the title role in the film The Great Buck Howard, a role inspired by the mentalist The Amazing Kreskin. Colin Hanks co-starred and his father, Tom Hanks, appeared as his on-screen father. In November 2009, Malkovich appeared in an advertisement for Nespresso with fellow actor George Clooney. He portrayed Quentin Turnbull in the film adaption of Jonah Hex. In 2009, Malkovich was approached for the role of the Marvel Comics villain Vulture in the unproduced Spider-Man 4. In 2011, he directed Julian Sands in A Celebration of Harold Pinter in the Pleasance Courtyard, Edinburgh for the Edinburgh Festival Fringe. In 2008, Malkovich directed in French Good Canary written by Zach Helm, with Cristiana Realli and Vincent Elbaz in the leading roles. Malkovich won the Molière Award best director for it. He also directed it in Spanish in Mexico, then in English at the Rose Theater in London in 2016. Ilan Goodman, Harry Lloyd and Freya Mavor were in the cast. Malkovich won the Milton Schulman Award for the best director at the Evening Standard Theater Awards in 2016. In 2012, he directed a production of a newly adapted French-language version of Les Liaisons Dangereuses for the Théâtre de l'Atelier in Paris. The production had a limited engagement in July 2013 at the Lincoln Center for the Performing Arts in New York City. In 2016, Malkovich wrote and starred in a movie called 100 Years: The Movie You Will Never See, directed by Robert Rodriguez. The movie is locked in a vault in the south of France, not to be seen before 2115. In 2014, the photographer Sandro Miller recreated 35 iconic portraits of John Malkovich as the subject, in a project called Malkovich, Malkovich, Malkovich: Homage to Photographer Master. Malkovich starred in his first video game role in Call of Duty: Advanced Warfare in the "Exo Zombies" mode. He appeared in the music video for Eminem's single "Phenomenal". In 2017, he appeared in some humorous Super Bowl commercials portraying himself attempting to gain control of the johnmalkovich.com domain. According to his mother, Malkovich is of Montenegrin ancestry from his father's side. Malkovich was married to actress Glenne Headly from 1982-88. They divorced after Malkovich became involved with Michelle Pfeiffer on the set of Dangerous Liaisons. He later met his long-term partner Nicoletta Peyran on the set of The Sheltering Sky, where she was the second assistant director, in 1989. They have two children, Amandine and Loewy. Malkovich is known for his distinctive voice, which The Guardian describes as wafting, whispery, and reedy. He does not consider himself to be a method actor. He is fluent in French, and for nearly 10 years he worked in a theater in Southern France. He and his family left France in a dispute over taxes in 2003, and he has since lived in Cambridge, Massachusetts. Malkovich stated in a 2011 interview that "I'm not a political person ... I don't have an ideology". He said that he had not voted since George McGovern lost his presidential run in 1972. Order of Merit (Ukraine), 3rd class (Kiev, 2018). 1 2 Wood, Gaby (September 30, 2001). "A multitude of Malkovich". The Guardian. London, UK. Retrieved December 22, 2008. ↑ "Joe-Anne Malkovich obituary". Benton Evening News. March 24, 2009. Retrieved March 22, 2010. ↑ "Daniel Ewing Malkovich, 59". The Randolph County Herald Tribune. Retrieved March 9, 2012. ↑ "John Malkovich biography". TV Guide. ↑ Telegraph Magazine (April 26, 2003). "Being John Malkovich". The Age. ↑ Sophie Lam (March 20, 2015). "John Malkovich: My life in travel". The Independent. ↑ Kralev, Nicholas (June 15, 2002). "Seeing John Malkovich" (reprint). NicholasKralev.com. Financial Times. Retrieved December 22, 2008. ↑ "John Malkovich". imdb.com. Retrieved June 16, 2018. 1 2 "John Malkovich biography". Yahoo! Movies. Retrieved December 22, 2008. ↑ "John Malkovich Emmy Nominated". Academy of Television Arts & Sciences. Retrieved March 9, 2012. ↑ Eurochannel. "The Paradox of John Malkovich". Eurochannel: The European TV channel. Retrieved June 16, 2018. ↑ Croatianhistory.net: John Malkovich; retrieved August 15, 2011. ↑ "John Malkovich Trunk Show at The Royal Court Theatre". Royal Court Theatre. April 30, 2005. Retrieved March 9, 2012. ↑ "John Malkovich and Flipping Uncle Kimono". International Press Clippings. Archived from the original on January 25, 2013. Retrieved January 28, 2013. ↑ "John Malkovich launches clothing line for wealthy guys". New York Post. February 17, 2010. Retrieved March 9, 2012. ↑ "John Malkovich: The Invisible Man". Boston Magazine. March 17, 2010. Archived from the original on January 6, 2012. Retrieved March 9, 2012. ↑ "Los Angeles Stage - Seduction and Despair: Hearing John Malkovich - page 1". Retrieved June 16, 2018. ↑ Creepy, Uncle (June 10, 2010). "Dozens of Images from Jonah Hex". Dread Central. Retrieved March 9, 2012. ↑ Brown, Jonathan (June 10, 2011). "Malkovich and Pinter: an unlikely alliance". The Independent. Retrieved April 29, 2012. ↑ "Les liaisons Dangereuses". Lesliaisonsdangereuses.fr. June 30, 2012. Retrieved January 24, 2014. ↑ "Lincoln Center Festival - Jewels". lincolncenterfestival.org. Retrieved June 16, 2018. ↑ "John Malkovich revealed as a playable Character in Cod:AW". Retrieved January 14, 2015. ↑ Tonys World (February 6, 2017). "John Malkovich - Squarespace Super Bowl 2017 Commercial" – via YouTube. ↑ "John Malkovich na Žumberku tražio svoje korijene". HRT Magazin (in English and Croatian). Hrvatska Radiotelevizija. 2017-10-06. Archived from the original (Video Interview) on 2017-10-06. Retrieved 17 March 2019. ↑ Akbar, Arifa (January 8, 2011). "John Malkovich: 'I don't need to be liked'". The Independent. Retrieved May 12, 2015. 1 2 Gaby Wood (September 30, 2001). "A multitude of Malkovich". London, UK: Guardian. Retrieved April 25, 2010. ↑ Ebert, Roger (September 30, 1984). "Chicago Has A Place In John Malkovich's Heart". Chicago Sun-Times. Retrieved July 20, 2015. ↑ Barber, Lynn (September 7, 2006). "Life and taxes". The Guardian. London, UK. Retrieved July 14, 2011. ↑ Syson, Damon (June 8, 2015). "Aficionado: John Malkovich". The Daily Telegraph. ↑ "Actor John Malkovich complains over Madoff fraud award". BBC News. April 3, 2010. Retrieved April 25, 2010. ↑ Zambito, Thomas; Larry McShane (February 5, 2009). "Sandy Koufax, John Malkovich among Bernie Madoff victims as court filings are released". New York Daily News. Retrieved July 23, 2009. ↑ Lyon, Jeff. "Malkovich Comes To Town For His One And Only Charity: Steppenwolf". Chicago Tribune. Retrieved August 7, 2013. ↑ Howell, Peter (September 11, 2008). "A Kinder, Gentler Malkovich". Toronto Star. Retrieved June 16, 2018. ↑ Fisk, Robert (March 10, 2012). "Robert Fisk: Condemn me, but get your facts right first". The Independent. Retrieved April 29, 2012.